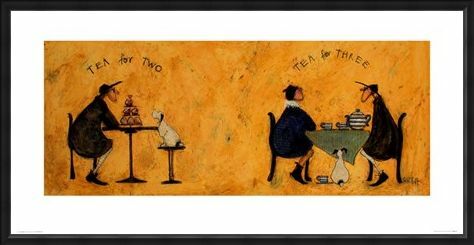 Art Print: Take a seat at the table and join Mr Ernest Hemingway, his wife Violet and their portly Jack Russell, Doris for afternoon tea. As Ernest and Doris initially dine alone with a delicious selection of cakes in front of them, Violet later joins and poor Doris is quickly removed off the chair and onto the floor. 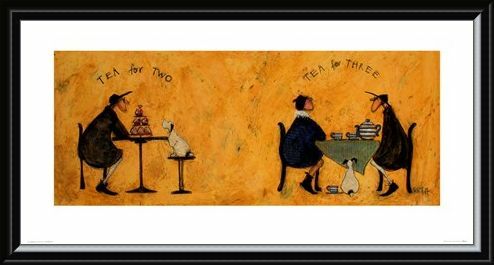 Set on a gorgeous amber background and bursting with the typical whimsical romance that Sam Toft is renowned for, this charming print is sure to make a heart warming addition to your contemporary collection. 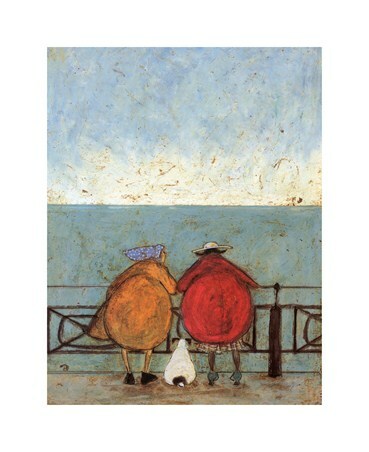 High quality, framed Tea For Two Tea For Three, Sam Toft print with a bespoke frame by our custom framing service.